Dolphin Encounters affords visitors to Salt Cay a particularly special experience: a chance to swim with the local bottlenose dolphins, get a kiss, or just watch from the side. There are also opportunities to interact with sea lions, who were brought to the island from Louisiana after their previous home was destroyed by Hurricane Katrina. Dolphin Encounters is based on Blue Lagoon Island (Salt Cay), roughly three miles (4.8km) northeast of Paradise Island. To start off a visit to Dolphin Encounters, visitors are taken on a 20-minute ride on a catamaran from Paradise Island to Blue Lagoon Island, and while on the catamaran visitors are given the chance to see the dolphins' natural habitat. Once visitors arrive on the island, they are taken to the Dolphin Encounters centre where it's possible to meet with one or more of the centre's dolphins or sea lions. The centre makes provision for those who are nervous swimmers, and even those who can't swim at all, by providing platforms for visitors inside the dolphins' pools. In addition to visitors' encounters with dolphins, there are also dolphin shows where the dolphins are given the chance to show off their tricks. 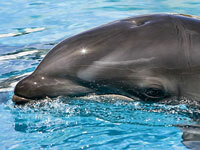 Dolphin Encounters is happy to host groups and birthday parties.